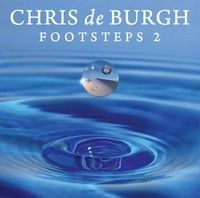 'Footsteps 2' has three brand new and original tracks, as well as songs which have moved and motivated Chris to become a better writer himself. The 10 'covers' on the album each proved influential to Chris in forging and developing his career and have acted like cornerstones in his life. "They were the footsteps, like stepping stones across the river, that helped me on my way." Songs on the album include 'The Living Years' by Mike and the Mechanics,"It suddenly hit me about my own relationship with my father, which was not the easiest. I couldn't drive because I was crying. The tears were rolling down my face and this song helped me to build bridges between myself and my father," to the likes of Steve Winwood's 'While you See a Chance', Roy Orbison's 'Blue Bayou' and Abba's 'S.O.S.' His approach to the songs were to produce "faithful" versions to the originals, where as others such as 'S.O.S' had an entirely different agenda for which the tempo and arrangement was altered in part. Arriving at the final tracks for 'Footsteps 2' - and their positioning in the running order of the album - was a painstaking process. "I spent a lot of time researching the tracks, going through songs, listening to songs, wondering if I could do a good job on them, whether I could add something to the original, or whether I was just going to do an 'homage' to the original." As always, Chris is set go on the road in support of his latest release. "I'm very much looking forward to going on tour in 2012 with 'Footsteps 2'. We'll be performing quite a few songs from it, which I'm really excited about doing."